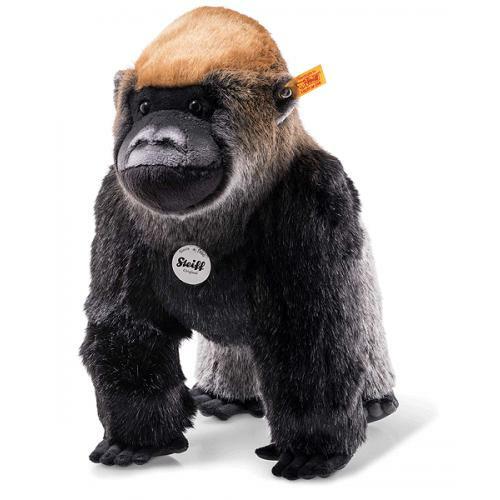 Protect Me Boogie Gorilla is hand made in the finest soft, Black & Silver plush with added Burnt Orange plush on his head and a mixture of the three colours running down his neck and back. Beautifully done!. He has his Steiff trademark Button in Ear and yellow tag in his left ear. This is Boogie, the grey gorilla from the Protect Me series. He is 35 cm tall and made from incredibly soft plush fabric. Boogie does just fine in a nursery. His real-life counterparts in the African rainforest are not doing so well. They are on the Red List of Threatened Species. This grand and powerful animal is at risk of extinction due to the destruction of its habitat and poaching by irresponsible trophy hunters. Boogie represents this wonderful species, which has strong protective instincts and a tremendous family bond. 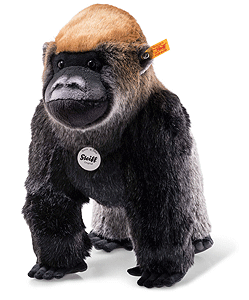 Protect Me Boogie gorilla stands on his own and has soft plush grey fur with beautiful shading that transitions from his body to his haunches. The middle of his head is brown. The intricate airbrush technique using black from head to foot complements this charming creature perfectly. He is an understanding playmate and cuddling partner for your child. He has a friendly face that will liven up your nursery and he loves to go on adventures.